The traditional Miss World Christmas party took place at the London Tower Hotel. It was a great time of relaxation and fun for the 121 candidates. Some of them finally met their relatives and national directors. The Top 15 talent finalists performed and then the girls took to the dance floor and danced and sang together. For Miss Guyana, it was “family night” in Miss World. Miss Brazil was happy to see their friends and member of the Brazilian organization in London: “My right arm, my team, my friends, ‪MMB family arrived. Very happy, thank you for your support and encouragement always”, she wrote on her Facebook page. Miss South Africa could not be happier having her mom by her side: “With the woman who taught me how to be a lady. I love you so much Mammie”. 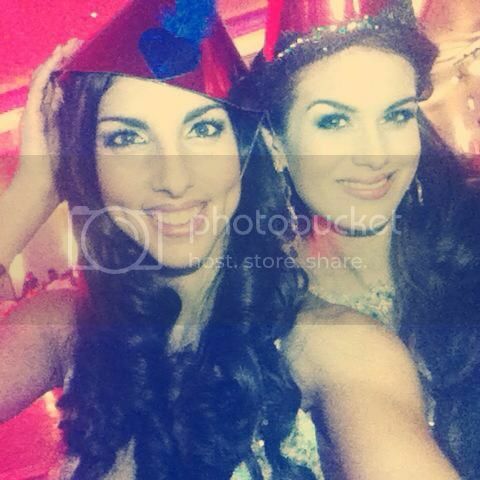 “Merry Christmas from the Miss World Christmas party!”, that’s what Miss England had to tell you all! Miss India was pure joy upon meeting her baby sister: “You know whats really refreshing? Meeting my younger sister after weeks! I had been missing my family so much and I was glad that the Miss World Organization organised a Family & Friends get-together of all contestants!”. Miss Australia “got adopted” by Miss USA’s mom: “Tonight was the Miss World Christmas Party and all our family and friends were invited. Unfortunately most of the girls, including me, don’t have our families arriving in London until later in the week, so I was very touched and so incredibly grateful to Miss USA’s Mum who gave me a little present tonight… My very own personalised jar of my favourite food in the world, Nutella!”. This was a great opportunity for the candidates to wear some of their best dresses and have a ball. What a beautiful group of candidates! Steve Douglas was the host for the night and CEO of MWO Julia Morley was present at the event.